Retirement is the freedom to do what I want, when I want, and how I want to do it. That’s basically how I describe my retirement now seven months old. Admittedly, it’s a simplistic way of explaining time that is now measured in repetitive Saturdays. Unencumbered with the toils of academic administration and the accompanying emotional ups and downs, my life has new meaning as I will explain later. I’ve learned quickly retirement is not a tabula rasa where all connections to university life are severed. There are things I miss. I miss the daily interactions with my staff; I miss the connections with the faculty and the creative energy I derived from them; I miss exploring with them the possibilities of a great university; I miss the collaborations that make dreams real; and I miss the intellectual stimulus that permeates the life of an engaged university. To have had a career as teacher, scholar and university administrator has been the greatest reward of my professional life. And yes, there are things I do not miss, like the perennial challenge to do more with dwindling resources. But seeking solutions to critical problems provided opportunities for fellowship and collaboration that endured beyond any successes or failures. Without these competing tensions, fulfillment might have been unattainable. Retirement does present its unique challenges, however. Transitioning from a programmed daily schedule to seemingly no restrictions on time is akin to being a man with a purpose to one in total isolation. And although my energies are no longer focused on advancing excellence, I nevertheless struggle to seek equanimity between a well-earned respite and the need to be progressively active. In my professional life, I was intensely involved in the community because I believed firmly that as a public servant I had responsibilities to actively participate in the public life of my community. As a private citizen, I quickly realized those obligations did not suddenly abate or vanish. I am as equally engaged as ever, even taking on new leadership roles. What is different now is that I am more sought after for counsel. I meet regularly with community members and groups seeking solutions to problems or advancing ideas that improve our community. I even participate in a group of retired businessmen, Sage, who gather together periodically over breakfast to learn, and to offer advice, about important civic and business issues. And perhaps the most important role I’ve assumed is leadership of the 100 Black Men of Greater South Bend. Our work with young black males is essential in ensuring a healthy and vibrant African American community. Amazingly, I am regularly asked about my adjustment to retirement; to those who inquire, I typically lightheartedly respond that I am so busy now I wonder when did I find time to work. This flawless transition to retirement rests largely on the plethora of advice I received from numerous retirees. A dear friend, a guru of business entrepreneurship, who initially adjusted roughly to retirement, gave me the most salient advice, plan a daily schedule and stay connected. In the months preceding retirement, my mother, fearing that I was too young and too accustomed to being busy, worried constantly that I would not fare well. To my friend, to my mother and to those who may have had similar concerns, retirement has been a blessing. Leaving the workplace, and particularly leaving an institution to which I’ve devoted enormous energy over fourteen years, was not easy. But I came to realize over time, that my time had come. The faculty and the new administration are building upon decades of academic excellence, and the university will continue to thrive, focusing on new energies, new visions, and renewed collaborative partnerships. The time is ripe for me to re-invent myself and re-dedicate myself to personal growth and to family. I have more freedom to do what is important to me. Melanie and I enjoy the extra time together, particularly our travels. Upon retirement, we embarked on a cross-country trip for two months visiting family and friends from coast to coast. I’ve rediscovered leisurely reading; my exercises are more routine, a benefit to my physical and emotional health; and I have more time for reflective thinking. What I look forward to now is spending more time in the garden, doing projects around the house and re-engaging my scholarly interests. Shortly, we leave for a two-month sojourn in southern France, but not before taking detours, Melanie to Portland to see the beautiful grandbaby, and I to New Orleans to see my mom, the youngest and the oldest family members. In my last blog entry of several months ago, I reveled in the seductive charms of New Orleans. Then the city was bathed in warm bright sunshine; except for a couple of warm days that greeted me upon arrival, the temperatures have been chilly and wet. I shouldn’t complain; Granger since my departure is still cloaked in snow with icy sub-zero or single digit degree temperatures. Unlike the last visit, my time in New Orleans has been spent chiefly with my mom. Entrances and exits of various family members have added spice to the fast moving days. Other than an occasional lunch out, I’ve not ventured far. I begin each morning with a three-mile walk in City Park near my mother’s home. The first day’s walk was with an old New Orleans childhood friend, Eileen Julien, and now colleague from the IU Bloomington campus, who was in town for the weekend. 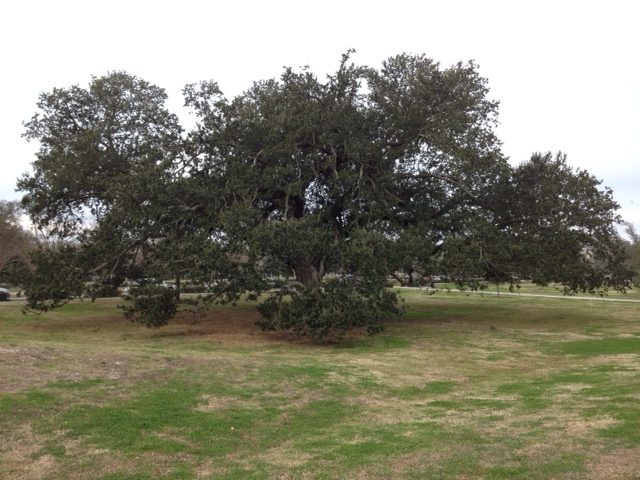 City Park, formerly a nineteenth-century plantation, is a beautiful and grand public space upon whose land resides the New Orleans Museum of Art. Picnic grounds and other recreational areas afford ample leisure. Native plantings, and sculpture and botanical gardens add natural and artificial beauty. Lining my walks are majestic oaks with snarling branches that loop up then curl downward, snake-like hovering inches above the ground. I imagine what passersby these venerable trees have witnessed over decades, some aimlessly walking, others, like me, walking briskly with purpose. What famous painter or writer over the centuries walked these same paths? What political figures? What families, prominent and ordinary? I imagine myself walking amongst them. And what natural catastrophes have these trees endured? Katrina surely had to have been the most traumatic! And still they stand gracefully in majestic splendor, resilient and defiant.